The show opens in a casino. Many people are gambling and the head of security, Pat, watches the cameras. He notices a man named Mack has been gambling for hours and drinking. He gets a report that several customers have complained. Several security officers tell Max he needs to leave and he attacks them. Mack is dragged out of the casino. Pat leaves and heads home. As he unlocks his front door he is shot in the head. Bull enters a restaurant to meet Marissa and her new man. He is not having a good time and hates the new guy immediately but is torn because he can tell how happy Marissa is with him. Bull gets a call from his old college roommate, Mack who is in jail. Bull heads out to meet him immediately. Mack tells Bull several witnesses heard him threaten to kill Pat but he didn’t do it. Pat was dead when he got to his house. Bull doesn’t think he can help because he doesn’t know the Native American Tribal system but Mack convinces Bull he is his only hope. Bull’s teamwork to research to laws of the tribe. Benny arrives to help start putting together Mack’s defense. Bull tells Benny that Mack and he were great friends in college and started holding illegal card games together. They made a lot of money but when the dean found out Mack was expelled but never told about Bull’s involvement. He owes him. As Benny and Bull talk Tamia enters. Tamia is Mack’s court-appointed attorney. Tamia tells them about the rules of the court. Benny can’t be Mack’s attorney since the chief of the tribe has appointed him. The chief will act as the judge and they only need a majority rather than a unanimous verdict to convict Mack of murder. The trial begins and the chief welcomes Bull. They will have two days to prepare for the trial to begin presenting evidence. Mack is granted bail which means Bull will have to come up with $100,000 to get Mack out of jail. Bull pulls money from IRA to pay the bail. Mack joins the team in New York to help prepare. 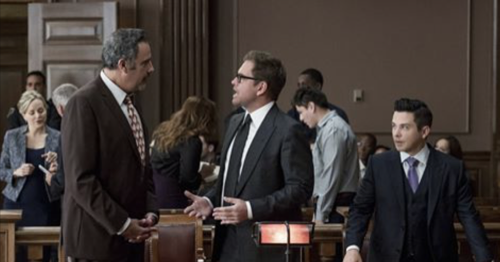 Bull learns that the juries are not randomly pulled to service. The jurors volunteer to serve and since they are a small community of only 1200 people it is usually that same 25 people who show up. He gives the team a list of their names. The team learns that reasonable doubt is not the standard for the trial court. It just has to be proven that Mack is more likely than not to be the murder. Marissa and her man go to his new project. He shares with her how excited he is about this new building and their relationship. Bull’s team start to interview several people in the tribe and at the casino trying to see if anyone else had a grudge against Pat. Bull jumps at the information. It is highly likely that this man, Joe is the actual killer. The trial resumes but Mack isn’t there. Bull gets the chief to give them an hour delay so they can check out the car dealership. They notice a newly poured concrete patch. Closing arguments begin and Tamia makes the case that the car dealer is the murderer. Just then the tribal police enter with the rifle used to kill Pat. It was found in the newly poured concrete in front of the car business. Mack is freed and the businessman is arrested.